It’s important that you take a minute to protect your privacy in Windows Media Player. 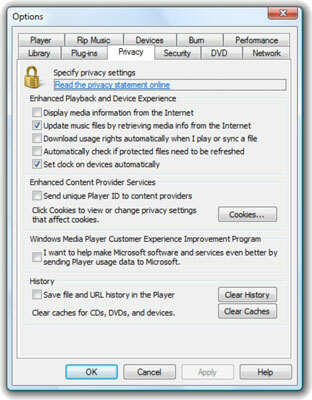 The best option is to block as many of the privacy settings as possible when you set up Windows Media Player, but you can use the Options dialog box to further protect your privacy. Windows Media Player 11, the version that shipped with Windows Vista, is a vast improvement to previous versions of the player that automatically sent all of your usage information to Microsoft. Microsoft now gives you a choice about what information is sent and how it is used — thanks in part to a lawsuit or two. Even if you protected your privacy with all the appropriate settings when you ran the first-time installation of WMP, you should still check out these settings to ensure that you’re protected. Microsoft “forgot” to put one privacy setting on the setup screen, and it doesn’t hurt to double-check and ensure that everything’s working in your favor. Follow these steps to get your privacy settings right. While running Windows Media Player, hold down Alt (that brings up the menu) and choose Tools→Options. WMP opens its Options dialog box. You see the privacy options, which closely mirror the options that you saw when you first ran WMP. Choose which privacy settings you want to use. There are many factors to consider, but here are a couple of guidelines. Update Music Files by Retrieving Media Information from the Internet. When you add music to your Library or rip a CD, WMP goes out and retrieves the album info, and then adds missing information from Microsoft’s giant database. Selecting this feature can save you a lot of time. Automatically Check If Protected Files Need to Be Refreshed: This option comes into play if you “rent” music on the Internet. If you rent media, you might want to be advised every time WMP reaches out to check on the rental status, and possibly charge your credit card. Uncheck the box unless the warnings bother you incessantly. Set Clock on Devices Automatically: This is the option that was left out of the original setup process. It ensures that your MP3 player’s clock is synchronized with your computer’s. This is of primary importance to folks who rent music on the Internet and transfer the rented files to an MP3 player. Keep this box checked unless you have an overwhelming need to change it. Your new privacy settings take effect immediately.